This ZPL rotary tablet press is an intelligent machine in small size with excellent rigidity. 1.This rotary tablet press has passed the small-scale test and pilotscale experiment and it is suitable for making large and small tablets in different specifications in small scale. 2. With the cabinet cast integrally, this product features outstanding overall rigidity, low noise and stable pressing performance. 3. The maximum pressure of the machine is 80kN. 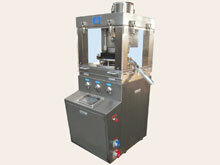 1.This single-press machine is mounted with quality dies in compliance with ZP and IPT standards. It gets the granular materials pressed into round and differently shaped tablets in various specifications through single side ejection. 2. The process of precompression and main compression improves the quality of tablets. 3. Continuously variable speed regulation unit plays a necessary role in achieving convenient, safe and reliable operation. 4. Configured with PLC programming unit with touch screen, this rotary tablet press offers digital display of rotating speed of turret, instant pressure of every set of working dies, impeller speed of forced feeder, product name, batch number, production time and other parameters. If the machine goes wrong with emergency stop, overload of motor, overpressure of system and other failure, the detailed information will be presented and recorded clearly. It is also convenient to set the pressure of system, average pressure of working dies, fill depth, thickness of tablet during precompression and main compression, production capacity and other data. Equipped with USB port, this machine allows users to use USB flash disc to collect and read the real-time working data every ten minutes for printing. 5. In reasonable structure, the main transmission unit runs stably. 6. Our rotary tablet press utilizes the overload protector for the motor via stopping the machine automatically if overload occurs. Additionally, it is also outfitted with overpressure protector, emergency stop device, powerful exhausting and heat dissipating devices, etc. 7. The outer stainless steel housing is completely sealed. Any part that is possible to contact with the medicine is made of stainless steel or specially treated on surface and it is nontoxic and corrosion resistant. The turret is also processed with particular surface treatment to avoid cross contamination. 8. The pressing chamber is made of four pieces of transparent organic glass. It can be completely opened for ease of internal cleaning and maintenance. 9. Users can select the forced feeder as they need. We provide four models of ZPL rotary tablet press machines with maximum production capacity of 41,000pcs/h, 49,600pcs/h, 72,900pcs/h and 81,000pcs/h, suitable for making large and small tablets in different specifications in small scale. FEIYUN, as a specialized pharmaceutical machinery manufacturer, besides the pharmaceutical tablet press, offers tablet coating machine, capsule filling machine, capsule polisher, medicine pack blister packaging machine as well as medical high purity nitrogen generator. All of FEIYUN pharmaceutical equipment conforms to cGMP standards. Please let us know if you want to buy quality pharmaceutical machines from China.